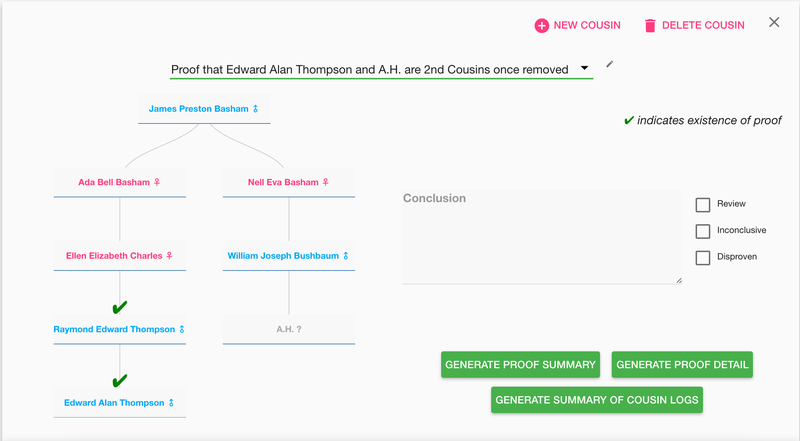 I am excited about the new Cousin Research Tracker in Evidentia, perhaps because it solves a problem for me. Why do I Need a Cousin Research Tracker? Anytime someone introduces a new tool, that is the question you should ask – “what problem does it solve? What do I do with a shaky leaf when it takes me to someone else’s family tree? Often I find that it takes me to someone who was led to MY family tree by there own shaky leaf. That’s fine, they may have other evidence that will help me with my research. Sadly, odds are good that their family tree is under cited. Are we related? I took an autosomal DNA test and, EUREKA a match! If the match was kind enough to share a family tree, AncestryDNA might actually identify a potential Most Recent Common Ancestor (MCRA), showing where our trees cross. 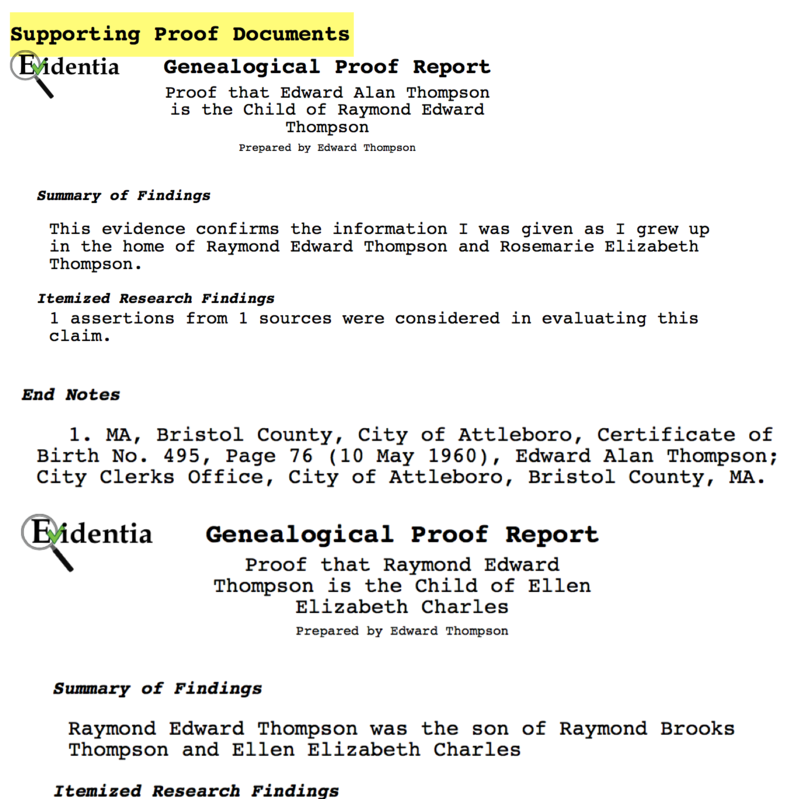 verify the document trail to confirm what the DNA evidence is pointing to. make sure that each link in the two paths has solid evidence to back it up. What is the Cousin Research Tracker? The Cousin Research Tracker in Evidentia allows me to create a “Possibility Tree”, an unproven graph displaying the possible link between myself and the matching “cousin”, whether that match comes from a shaky leaf or a DNA test. It then tracks my progress in providing evidence and proofs for each link in the tree. Once all links are proven, I can declare with confidence that I have indeed discovered a new cousin. 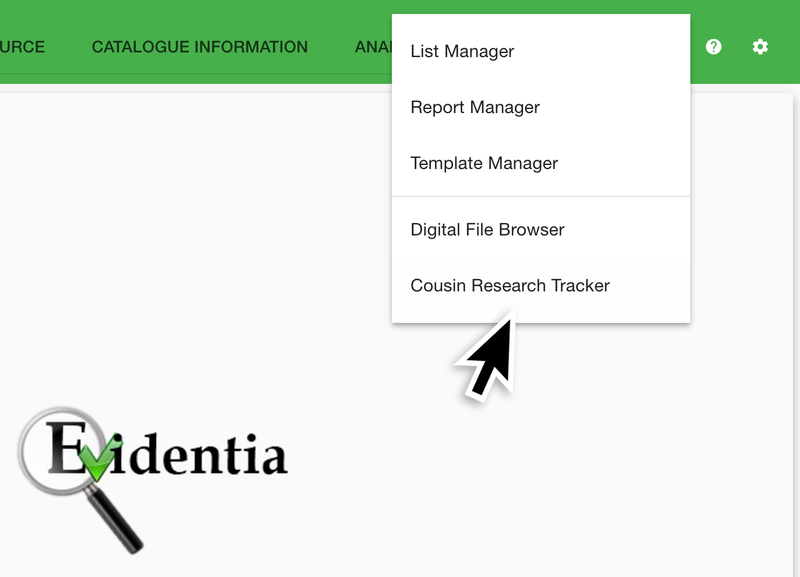 To access the Cousin Research Tracker in Evidentia, open the List Menu, and select the tracker. This will take you the the main Screen. If you have Cousin Tracker entries already, you can select from the drop down list. Entries with a green check mark are complete. Entries with a yellow check mark were completed at one time, but you have entered new evidence at some point, requiring that you review your conclusions. All other entries are in progress. To create a new Cousin Research entry, select New Cousin. A field for the possible cousin you are trying to prove (or disprove) a relationship with. Unfortunately, Evidentia does not provide any tools for discovering who the MCRA might be – some good old fashioned detective work will be required. If you wish to add a new person, simply input the name (last name first) and hit enter. Evidentia will add the subject, and a notification will appear at the bottom letting you know you should update that entry with a gender. After populating these three fields, you will want to start filling in the descendants of the MCRA that lead to you, then the descendants of the MCRA that lead to your “cousin”. This is not a traditional tree that shows both parents – you only want to establish the direct lines. Once you have created the “Possibility Tree”, click save and you will be returned to the main Cousin Tracker screen. Clicking on a green check mark or an “In Progress” label will take you to the Analyze Evidence screen for that proof. 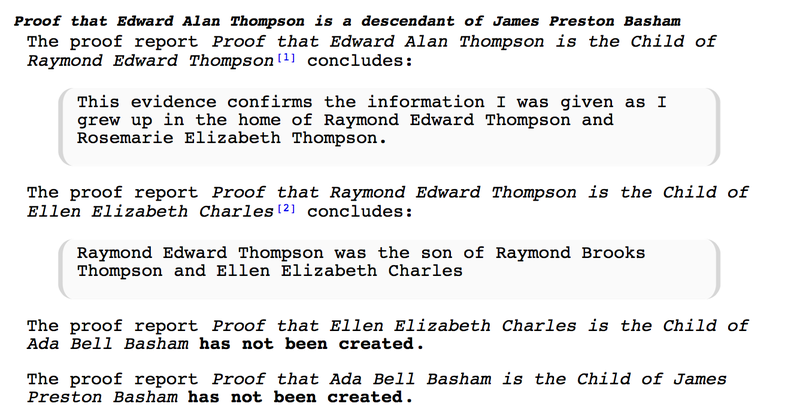 In the Cousin Research Tracker, Evidentia is letting you use your own proof reports as cited sources. To understand this better, we will look at the Proof Report generated from this screen. The Cousin proof Summary Report summarizes the relationship we are trying to prove in the title. Then it shows the graph of the two lines, followed by the final conclusion if one has been written. This is the overall conclusion written on the Cousin Research Tracker main screen. In this example I have yet to write my final conclusion. Next, the report summarizes the first line we are trying to prove – the one between myself and the MCRA. I also have a second proof for the relationship between my father and my grandfather. That is a separate document that I am citing. Since no proof exists for the final two relationships in the line, the report notes that. Next the report summarizes the second line we are trying to prove – the one between my “cousin” and the MCRA. You may have to work with your “cousin” to create the supporting proofs. Finally you have the citations for the proofs you used in THIS proof. 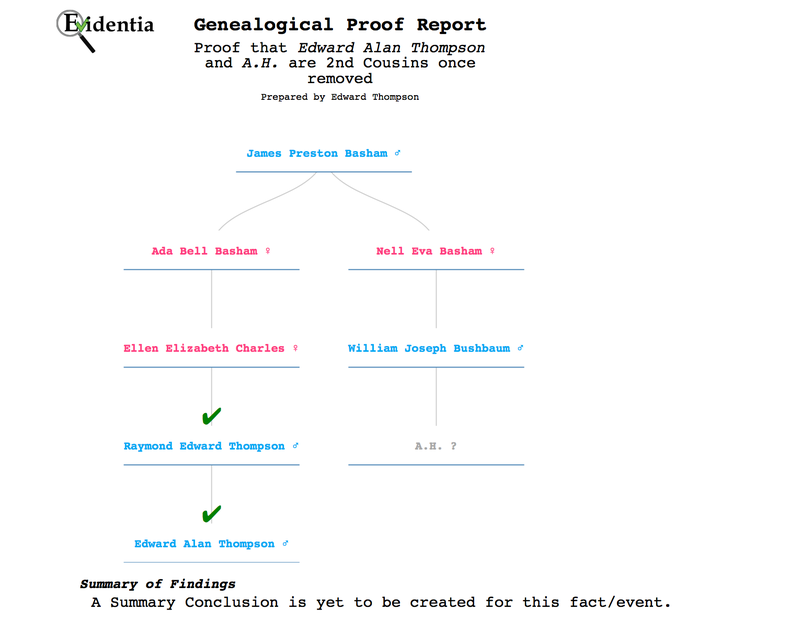 The Cousin Proof Detail report is similar to the Cousin Proof Summary Report, except that it appends a copy of each supporting proof at the end of the cousin proof. I see a lot of possibility for this tool, and in fact plan to build other tools on top of it. 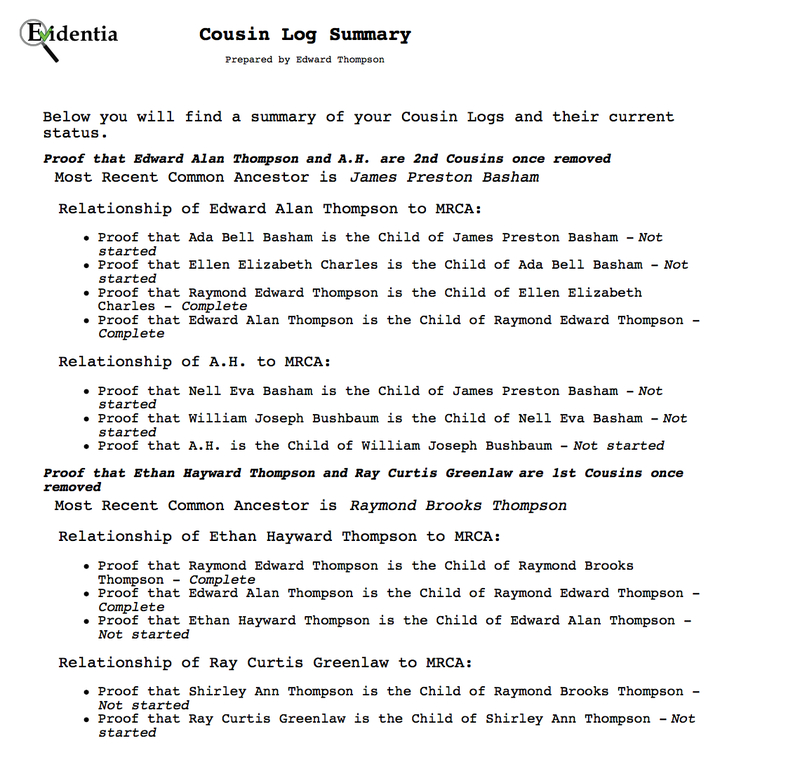 There is one more tool in the Cousin Tracker that I think will be valuable, and that is the Summary of Cousins Log. This report summarizes the current state of ALL your cousin research. Evidentia does not help in determining MCRA. This requires comparing two trees, and Evidentia does not maintain a full ancestry tree in its database. I may want to track other evidence related to my DNA results. Rest assured we are working to address many of these issues in a future release.